Desire is a powerful force that can help you manifest faster if you know how to use it. It isn't just a simple matter of wanting something. It's about deciding that something will happen and nothing will stand in your way from making it so. When you want to manifest something badly enough, you'll do more than just ask for what you want and passively sit by, hoping that it will come to you. You'll get out and take action to bring it about. Whenever little guiding signs or inspirations come to you, you follow through on them – no questions asked. You will call the person you keep thinking about. You will take a class. You will apply for a different job. You will stop at the car dealership…if your desire is strong enough. Sometimes you might be too scared to take action; things are so much more comfortable if they remain exactly as they are. You may not like how things are, but at least you know what to expect. You know what's going to happen on a daily basis. You know how to deal with everything. It may not be easy, but at least you're used to it. And that's the hard part…because sometimes, in order to have a strong enough desire, you have to step outside of your comfort zone. You have to take a risk. You have to remove the safety net. When you are at a point where you have no choice but to succeed, no choice but to manifest your dreams, then you will do whatever it takes. Your desire is so strong that nothing can stand in your way. Things suddenly begin going your way. It's as if miracles start appearing all over the place. Things speed up. Your desire starts manifesting faster. And before you know it, you have what you want. When you want something so badly that you won't take no for an answer, you combine a willingness to do whatever it takes with the intent to make it a reality. When that happens, the Universe responds and your desire manifests fast. When your desire is strong enough, the only result is for it to manifest quickly. 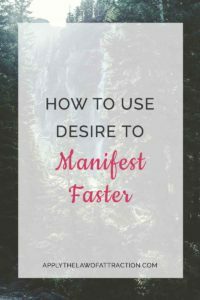 How can you increase your desire so you can manifest faster? The first thing you need to do is make sure you're trying to manifest something you really want, rather than something you think you should manifest. It's great to try to create something because you want to make someone else happy or because you think it's something you're supposed to have, but if you really want to make the Law of Attraction work fast, you need to focus on the things that are really important to you. When you focus on attracting something that's really important to you, it's much easier to create a lot of desire. It comes naturally. Once you have your important goal, you can ramp up your desire even more, by focusing on feeling good. Do whatever works for you to raise your energy. The higher your energy, the easier it is to achieve a state where you know nothing will stand in your way from manifesting what you want. When you raise your energy and stay in a state where you're feeling good, your vibrational energy changes. It becomes faster and synchronicities begin to occur. The result is your manifestations appear quickly. Success is yours. ive been going threw alot of non stop bad relationships and ive be asking and ive very hopeful and positive but im still a little sad and i keep telling myself how will i be able to attract my dream lover into my life by crying every now and then. Ive been thinking in a postitive way ive been asking the universe to manifest my desires and ive been believing that the universe will manifest my desires too. Its just that ive been threw alot. When my ex boyfriend broke up with me he did some hurtful things and even the smallest things he would say about me would have tears streaming down my cheeks the samething happened last year too. Ive been so positive and ive followed the steps and my heart but i just get emotional sometimes about attacking my dream lover. Will this block me from receiving what i want?